My son’s new fiancée had come to pick him up, but they accepted an invitation to stay for dinner first. We were telling a few family tales around the table of growing up and hit the subject of food and small children. I told them that our oldest, upon being given her first taste of beets, immediately spit them out in my face — it was the only thing that she ever reacted so vehemently to. She still can’t stand them. My son turned to his intended and asked, “Do you like beets?” I realized that there were still many things that they didn’t know about each other. We all have things we like and don’t like. We all have personal preferences, and there’s no problem with that, as long as we differentiate preferences and principles. It’s been a big deal to me, to have beets this year. It’s my third try, and my first success. The first year in this house I only made a garden in the seven-by-seven foot section on the side of the house, set off with cement boundaries by someone in years past. I planted potatoes in the back corner, and beets next to them; the potatoes muscled out any growth for the beets. First failure. The following year I had some of the space on the other side of the walkway to the gate dug out, and planted potatoes over there, far away, and beets in the middle of the original plot. However, golden beets don’t have any red in the leaves, and when the weeds got away from me, I apparently yanked out the beets, inadvertently, that were coming up under them. The other patch of regular beets didn’t thrive because I didn’t thin them enough — I didn’t get anything bigger than marbles, and not many of those. Second failure. By now I really wanted some beets. So this year the beets went into prime space within that plot. I sat down on the retaining wall to see how far my arm reached out comfortably, and set a string along the length to mark that boundary. 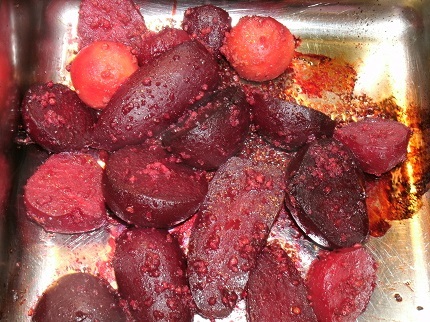 I had learned that beets would take more daily care than tomatoes. One of each variety, L to R by whole plant: Detroit (standard), golden, bull’s blood (dark leaves), and cylyndra. Now I wouldn’t have to bend over with my bad back to weed the rows, and the beets would have sun. I thinned them carefully and we ate the greens of the ones I had to pull. This year we had a harvest. Though they didn’t get very big, I have friends who didn’t get anything usable at all this season, who have grown beets for years. Our weird weather this year? I don’t know. 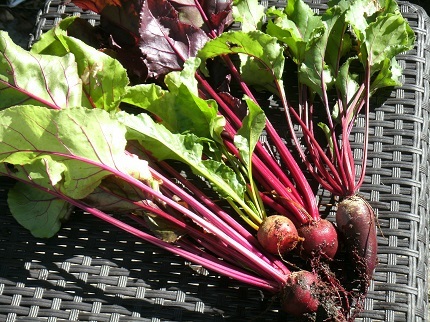 We love beets enough that I planted four types, to see what we liked best. Hands down it’s the cylindrical beets that we’d never seen before; they need less elbow room, which is a bonus, and their flavor is sweet and striking. We’ve also discovered the enhancement of roasting them. Out of the oven roasted and delicious, newfound recipe. Clearly we are beet lovers. Some of you might be beet loathers. No problem, you undoubtedly have other foods you love. That’s simply a preference; within the principles of choosing nourishing food, or pursuing a harvest, there are many choices to make. Your harvest may not be growing crops in the ground (on however large or small a scale) but may be growing a new business or stepping up to a new calling. The most universal process of nurturing is in our families; for many years I was absorbed in growing children, and I rediscovered the processes of sun, seeds, and soil when our nest became empty and it became necessary to sell our home. I think I needed the affirmation. There are principles involved in our family life. We need to devote time and attention to our families so that they may be safe. Elder Bradley Foster counseled us at Conference to be the “intentional parent.” Physical safekeeping is obvious for our little ones, but spiritual safety must be built as well. It’s trickier to support, encourage, and guard as they go beyond “Don’t touch the hot stove, or run out into the street,” into the realms of peer pressure, self-doubt, and the enticements of the world. There are so many attacks on our souls today. The 1995 Proclamation on the Family outlines principles that stand true. The counsel to engage our families in service and in wholesome family activities is an opportunity for preferences. Perhaps you like to go camping, maybe you love the movies, or you can identify persons in need of your help and pitch in together. There are a lot of ways to bind your family together in faith, enjoyment, and good works, but those connections are vital. Make memories of love and adventure with them. The principle is to “be actively involved” and seek the guidance of the Spirit in all your concerns. Some principles are clear-cut. Don’t be a thief, don’t be cruel to anyone, do be faithful in your Church callings, do pray with real intent, every day. Let married life wait for marriage, and be faithful in marriage. Cherish your spouse and children. Obey the Word of Wisdom and pay your tithing. Listen to the prophets and follow their counsel. The promises are clear to us too; we will develop a closer relationship with our Heavenly Father as we receive a greater measure of his Spirit guiding and strengthening us. The world says a lot of things that aren’t true, and elevates personal preferences to a supreme status above the commandments. Those messages are false and dangerous. How many lives fall into addiction, misery, and emptiness by listening to the fallen world instead of our loving Father, and going down our Enemy’s paths? Satan only calls us to destruction, but he masks that skillfully. The Lord always calls us with love, even if the way is hard. Look down your road and try to see where it will actually take you in the end. v.12 And behold, I say unto you that if ye do this ye shall always rejoice, and be filled with the love of God, and always retain a remission of your sins; and ye shall grow in the knowledge of the glory of him that created you, or in the knowledge of that which is just and true…. v.20 And behold, even at this time, ye have been calling on his name, and begging for a remission of your sins. And has he suffered that ye have begged in vain? Nay; he has poured out his Spirit upon you, and has caused that your hearts should be filled with joy, and has caused that your mouths should be stopped that ye could not find utterance, so exceedingly great was your joy. As Alma put it, we will learn to sing the song of redeeming love. That promise cannot be fulfilled in the world, only in the love of God, for he is the only one who can teach us to sing it.